When Castle in the Air first opened its doors on Fourth Street eleven years ago, I was full of anticipation over who might cross the threshold into our fledgling fantasy world. It didn’t take long for the parade of artists, writers, and dreamers to begin, and one of the first was the wonderfully eccentric Reginald Bakeley. A self-proclaimed “fairy hunter,” Mr. Bakeley made a beeline for the shop due to—as he put it—our “preponderance of gnomes.” Reginald specialized in tracking and bagging these forest fairies in particular, and thought that we might be a partner in his work. (I honestly think he mistook our collection of concrete garden gnomes as a set of decoys similar to those used in duck hunting.) He brought with him on his first visit a handful of booklets he’d made himself, each of them outlining specific interactions with the Fairy Kingdom. There was “On Gnoming: A Pocket Guide to the Successful Hunting and Cooking of Gnomes” and “Goblinproofing One’s Chicken Coop: An Instructional Pamphlet for Use in Successful Animal Husbandry.” As if to temper the violence in these first two booklets, Reginald also brought his pamphlet collecting Lewis Carroll’s rules for some variations on backyard croquet. Even though I don’t eat gnomes myself, and find hunting to be particularly beastly, I couldn’t help but welcome Reginald and his odd little booklets into our world. Their popularity over the years helps me see that there is more than one way to step into the realm of the fairies, and that sometimes it’s advisable to bring some protection. This idea has caught on, and in a big way, because we recently received a box of Reginald Bakeley’s latest work. It’s a full-fledged book this time, and it expands on Reginald’s message of how best to live in a world overrun by gnomes, goblins, brownies, mermaids, and other such mischief-makers. Make sure to ask for a copy if you think the fairies might be wreaking havoc in your own life (or if you have any friends with backyard chickens). 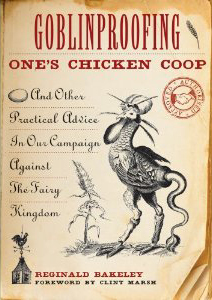 Goblinproofing One’s Chicken Coop and Other Practical Advice in Our Campaign Against the Fairy Kingdom, by Reginald Bakeley, foreword by Clint Marsh. 208 pages, paperback. Available at Castle in the Air or through our Online Shoppe.